- the top rib does not reach the rear end of the shafts 23 to 26 mm and forms a small hook soldered with tin and sailoruranus joint. The shotgun tested in a closed tyre according to the requirements of the OGPU ¹319-55 and deemed fit for use. According to the technical conditions of the right of the barrel at the target must get at least 45% pellets, and from the left - 55%. From each stola is no more than three shots, and if one of them gave the above hit, the battle of the barrel is satisfactory. 1. The top rib. 2. Small hook. 3. Ejector. 4. The transverse pin. 5. PEEN. 6. The trigger. 7. Screw the shock mechanisms. 8. The lever lock. 9. The percussion mechanism. 10. Frame locking. 11. Box. 12. The front hook. 13. The axis of the hinge. 14. The fore-end. 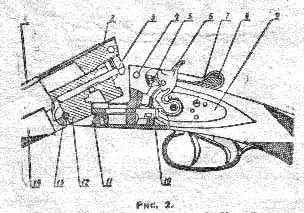 To disassemble and assemble the gun should always be in strict sequence whilst observing carefully and without using excessive force and shock. Getting started razborke must first discharge the shotgun. 1. To separate the forearm from the barrels. 2. 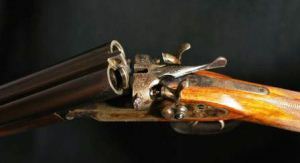 Take the shotgun with her right hand on the neck of the Lodge, with the thumb lever lock to take to the extreme right. Supporting trunks with his left hand, slowly rotate them down and separate from the box. 3. Remove the screw of the shock mechanisms. 4. Screw screw shock mechanisms on the right side at the base of the right shock mechanism and use it to gently separate the right impactor. 5. Through the hole in the bed for whispered gently push a wooden rod left impactor. The Assembly of the shock mechanisms in the reverse sequence. When setting the shock mechanisms, the slopes must be filed forward to failure. g) left arm turn axis of the hinge to protertia front lower hook and right hand, rotating the box up and down, connect the box with guns. Note. The Department of percussion mechanisms should be performed only when replacing winter or summer lubricants. 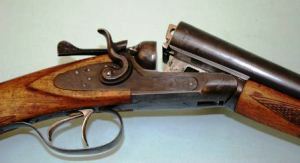 Complete disassembly of the shotgun is carried out in cases of extreme necessity and produced only in a weapons workshop. Leave screwdrivers used in Assembly and disassembly of the shotgun should be well-made and fit the slots of the screws. Under the label TOZ-BM shotguns the Tula plant was produced from 1957 to 1960 -th year.